The first volume of our Stalingrad panzer series is much larger than originally planned. At almost 580 large-format pages, the combat histories of Panzer-Abteilungen 103, 129 and 160 are examined in depth, both in text and photos. 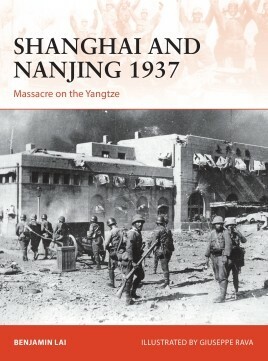 The pre-publication will be announced in the next few weeks. Thanks to everyone for their patience. The wait will be worth it! Our new 1/144 scale (10mm) BRDM-2 and several variants are now available for advance orders on our website. The production moulds are almost ready to go and models will be despatched as soon as the moulds are up and running. 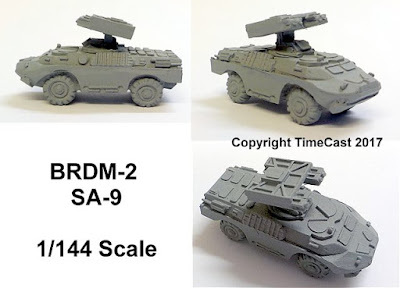 A BRDM anti-tank variant. Equipped with AT-5 Spandrel ATGMs this vehicle was found in Soviet Regimental and Divisional Anti-Tank units. surface to air missiles, this vehicle was found in the Regimental Air Defence Batteries. A command variant of the BRDM-2, equipped with extra radios. 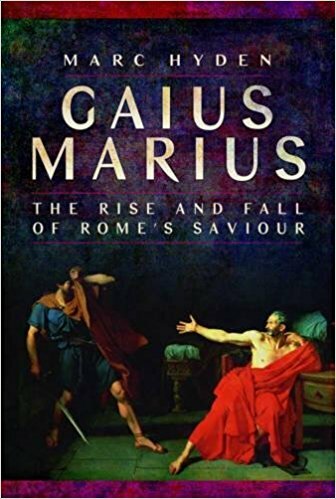 Gaius Marius was one of the most remarkable and significant figures of the late Roman Republic. At a time when power tended to be restricted to a clique of influential families, he rose from relatively humble origins to attain the top office of consul. He even went on to hold the post an unprecedented seven times. 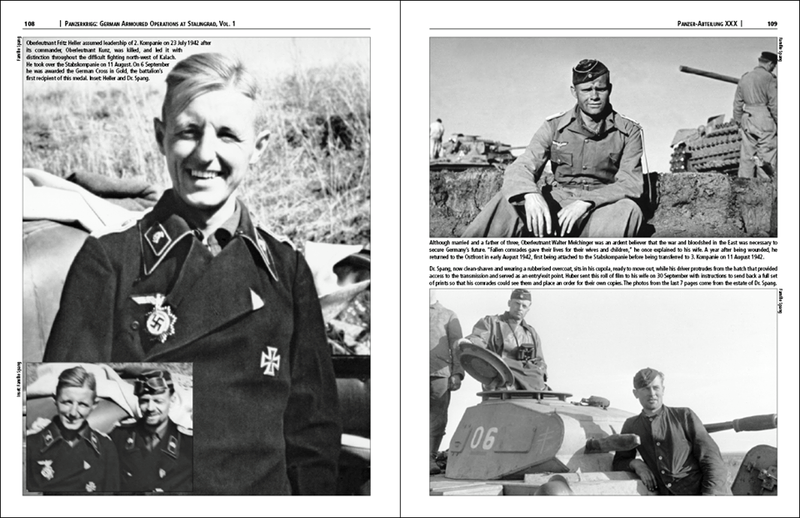 His political career flourished but was primarily built on military success. First serving in the Numantine War in Spain, he later rose to high command and brought a long-running war in North Africa to a successful conclusion, bringing the Numidian King Jurgurtha back in chains. 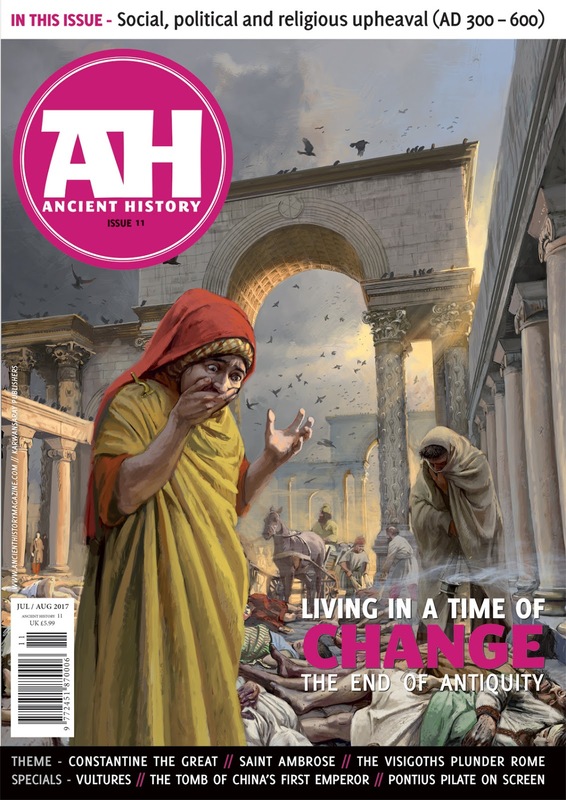 His return was timely as northern barbarian tribes threatened Italy and had previously defeated several Roman armies. Marius reformed and retrained the Republic's forces and decisively defeated the invaders that had easily overpowered his predecessors. Marius' subsequent career was primarily that of an elder statesman, but it was dominated by his rivalry with his erstwhile subordinate, Sulla, which ultimately led to the latter's bloody coup. Marius, once hailed as the saviour of Rome, eventually became a desperate fugitive, literally fleeing for his life from his pursuers. However, after several harrowing brushes with death, Marius seized an opportunity to return to Rome and mete out justice to his enemies, which tarnished his once-enviable reputation. 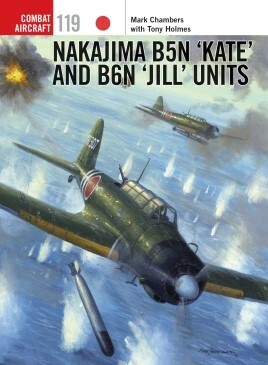 Soaring high above the fields and cities of Europe and Asia as well as the vast expanse of the Pacific, Allied and Axis pilots engaged in a deadly battle for control of the skies in World War II. Whoever won the skies would win the war. 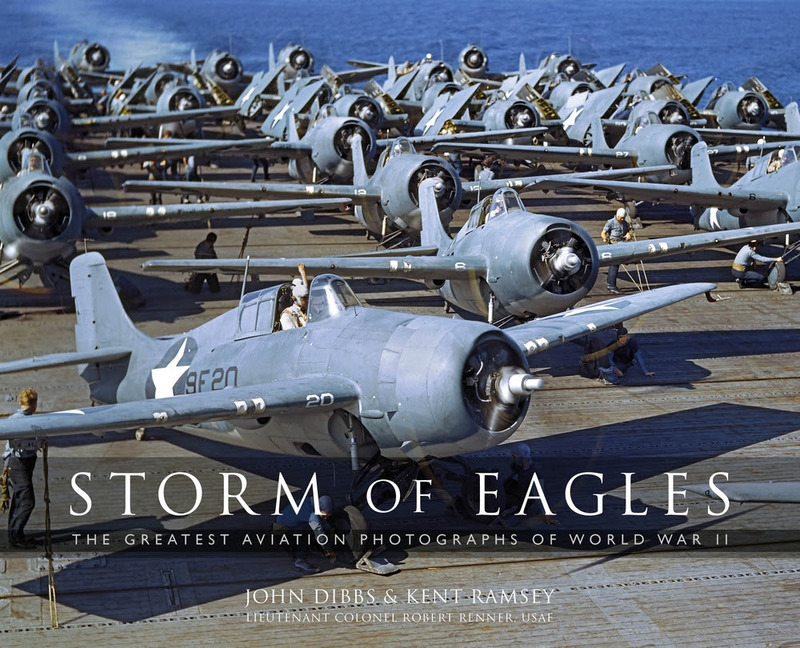 Published in association with the National Museum of World War II Aviation, Storm of Eagles is a fully illustrated coffee-table book that brings together classic as well as never-before-seen wartime images. 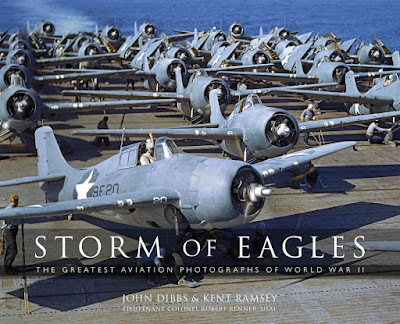 Compiled by one of the world's premier aviation photographers and historians, this remarkable volume is a must-have for anyone interested in World War II aviation. 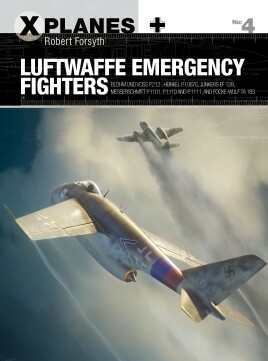 In late 1944, the German Air Ministry organised what it called an ‘Emergency Fighter Competition' intended to produce designs for quick-to-build yet technically and tactically effective jet fighter aircraft capable of tackling the anticipated arrival of the B-29 Superfortress over Europe, as well as the British Mosquito and US P-38 Lightning which were appearing in ever greater numbers. 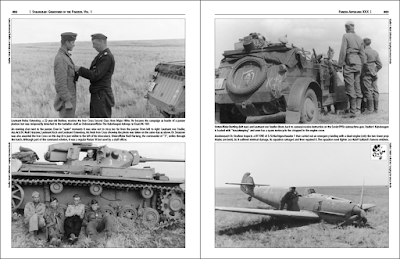 Thus was born a cutting-edge, highly sophisticated series of aircraft including the futuristic and elegant Focke-Wulf Ta 183; the extraordinary Blohm und Voss P.212, and the state-of-the-art Messerschmitt P.1101 series. Armed with heavy cannon and the latest air-to-air rockets and missiles, these were designed to inflict carnage on American bomber formations at high speed. 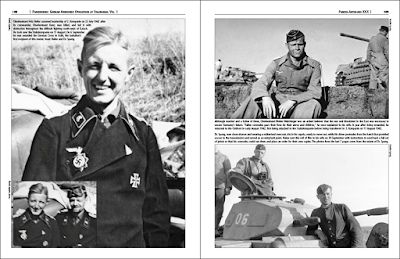 Using stunning three-view illustrations of each prototype along with full colour artwork, aviation expert Robert Forsyth traces the history of the extraordinary aircraft of the ‘Emergency Fighter Competition', Hitler's last throw of the dice in the air war against the Allies. Following the D-Day landings on 6 June 1944, the First US Army engaged in a six-week struggle to break out of the Normandy beachhead. 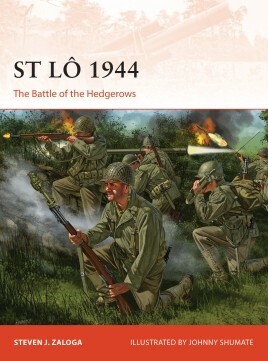 The hedgerow country of lower Normandy, called the Bocage, presented unanticipated tactical problems since it proved to be ideal for German infantry defense. 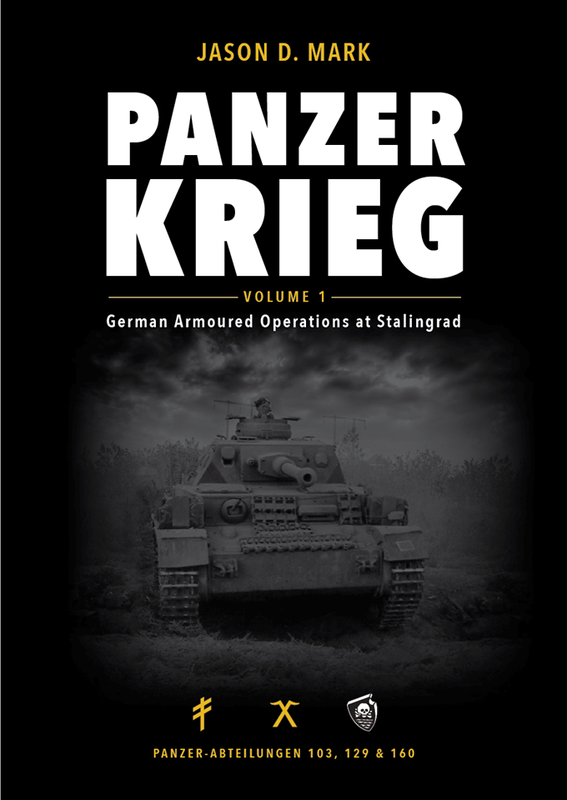 This book examines the brutal attritional struggle in June-July 1944 to overcome the determined German defense and secure St Lô. The city was the site of a crucial cross-roads and was thus a vital target for the invading Allied forces; the initial bombing attacks were so severe that the journalist and poet Samuel Beckett would later report that it had been 'bombed out of existence in one night'. 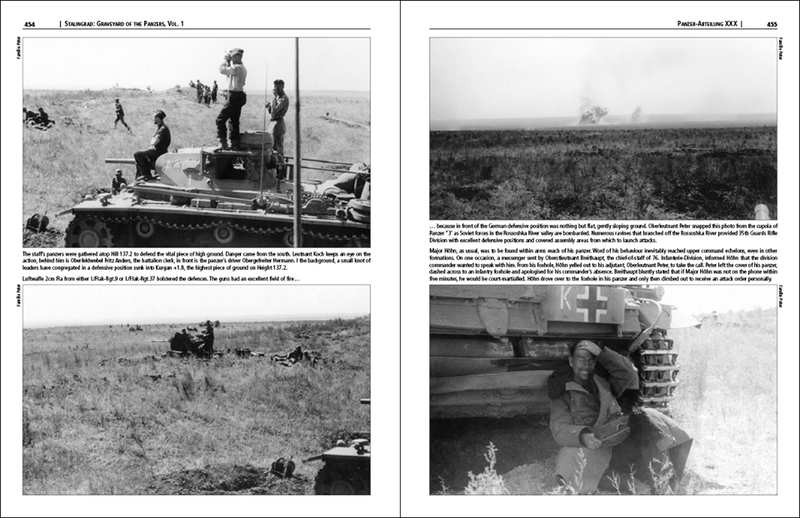 The attack by ground forces turned into a brutal attritional struggle to overcome the determined German defense. Using full-colour artwork, photographs and maps, this is the engaging story of one of the key engagements in the Battle of Normandy. When it was introduced into service in 1953, the T-10 represented a return to the "classic” Soviet heavy tank. 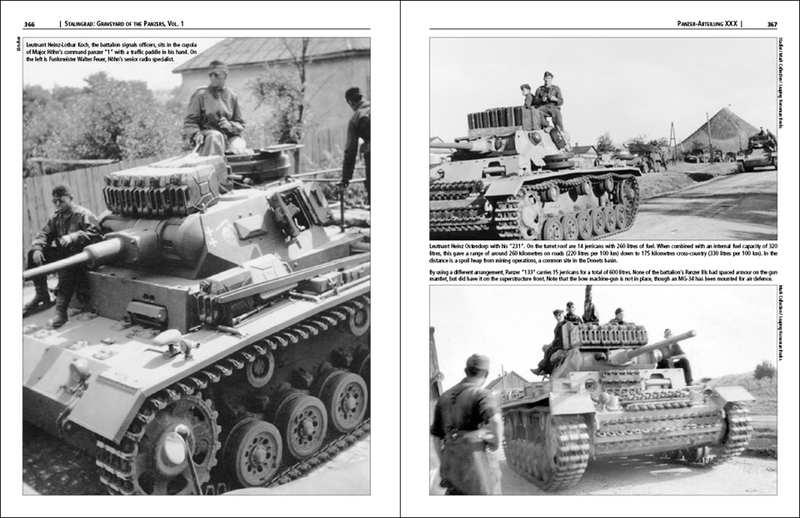 Although considered a major threat to NATO tank forces, it also represented the end of an era. 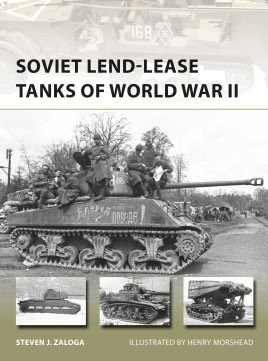 All gun heavy tanks like the T-10 would eventually be made effectively redundant by later models like the T-62 which had powerful next generation armament and new ammunition types. 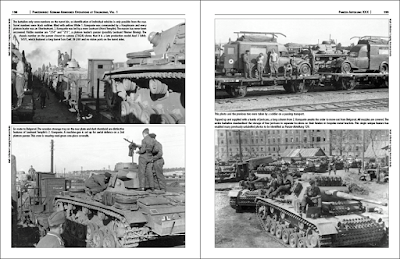 The tank was gradually withdrawn from service in the 1970s, though the last tanks would only leave Russian service, by decree of the President of the Russian Federation, in 1997. 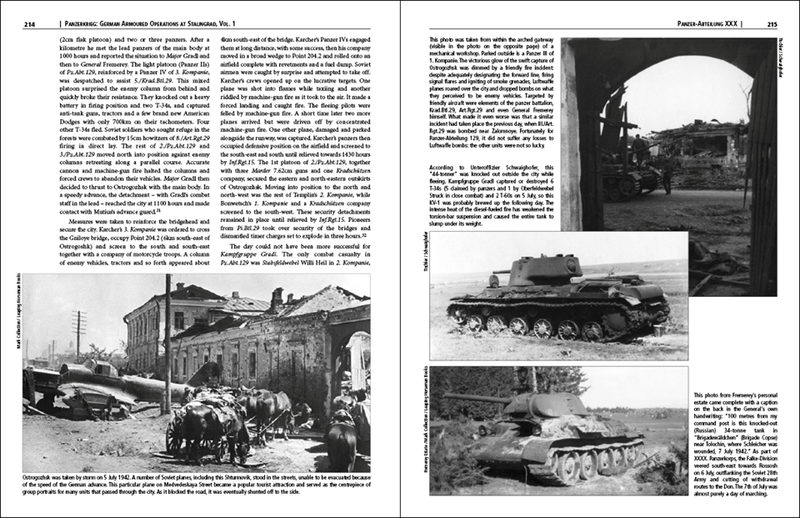 As such the T-10 outlived the Soviet state that had created it. 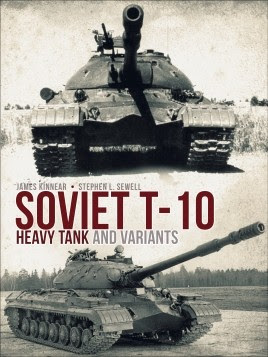 Never exported outside of the Soviet Union and rarely used in combat, the T-10 has remained a mysterious tank, with many of its variants unknown in the West until very recently. 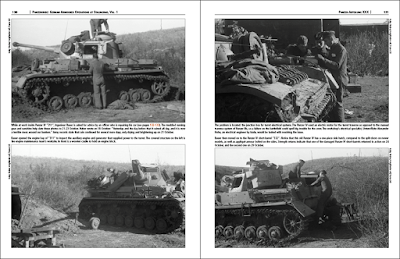 This study, written from original Russian and Ukrainian primary source documents that have only recently been made available, uncovers the history of this enigmatic tank using 130 stunning contemporary and modern photographs of the T-10 as well as full colour side-view artwork. In 1919, the US Government declared the production, distribution, and sale of alcohol illegal. America officially became a ‘dry' land. That didn't stop people from drinking, however, and the rise of the ‘speakeasy' offered huge new opportunities for organized crime. Soon, cities both large and small became battlegrounds as various crime syndicates vied for control of the underground alcohol trade. 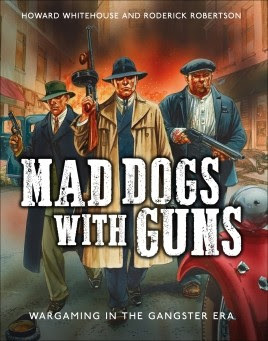 In Mad Dogs With Guns, players form their own small gangs of fedora-wearing, tommy gun-wielding gangsters and battle it out with their rivals. With numerous different gangs to choose from, including cops and G-men, a fully integrated campaign system, and rules for special situations such as car chases, the game offers a huge variety of tactical challenges. Bribe public officials, attend a gangland funeral, but always watch your back - there is always another gang waiting to poach your territory. The Frozen City harbours many secrets, and not all of them are ancient. While most adventurers who brave the dangers seek wealth and lost magic, some journey into Frostgrave for more personal reasons. 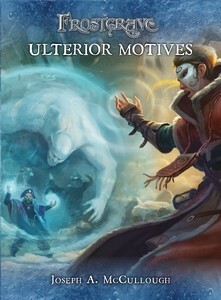 This expansion for Frostgrave consists of 40 Ulterior Motive cards, which add variety, depth, and new tactical challenges to wargames in the Frozen City. Each card presents the player with a specific task to accomplish and offers rewards if they succeed. Some of these missions must be revealed to all of the players, others must be kept secret. Will your wizard seek to slay a great demon? Rescue a desperate captive? Bring retribution to an enemy? All wizards seek power, but what are their ulterior motives? 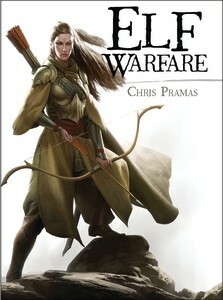 Although few in number, elves produce the most skilful and deadly warriors of all the races. Renowned for their archery and agility, they are mostly associated with hit and run tactics; however, they should not be underestimated in open battle. 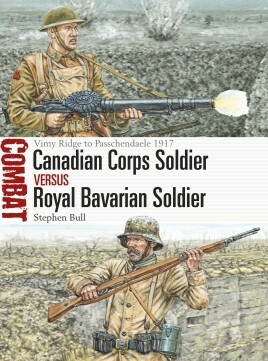 This book compiles all of the information known about these elegant warriors and how they practise war. 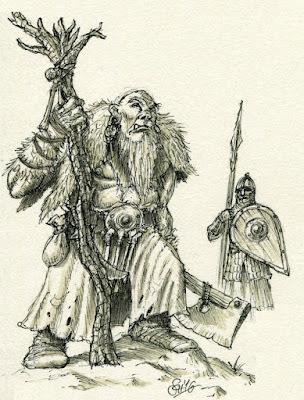 From an initial examination of the fighting methods of the individual elf fighter, it expands to look at how they do battle in small companies and vast armies. It covers all of their troop types from their justifiably famous bowmen and swordmasters to their lightning fast cavalry, making note of regional variations and highly specialized fighters such as war mages. Accompanied by numerous illustrations in both colour and black and white, this book examines specific battles in great detail in order to fully demonstrate the elf way of war. Photo of Replicator 2 prototype. As often is the case with the ERA versions, it's not the best print, I'm afraid! 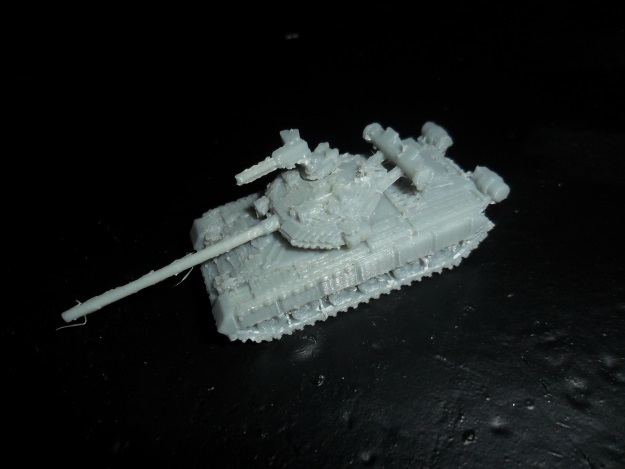 However, I am planning to put an order in in the next few weeks to Shapeways (partly to test their new HP plastic material as part of the closed beta), so I will get one of these done in WSF and that material - photos will follow! For July's release (which may be more towards the back end of the month again), I am nominally planning to have a break from Russian tanks for a bit and do something different. 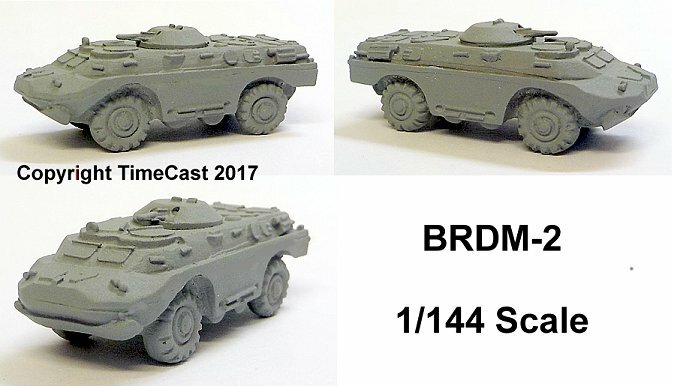 I am half-planning either the M114 or the Marder 1 (possibly the latter because it might be theoretically simple). We shall see how I get on, though - I need to do a few bits of starships, and I REALLY would like to get my starship rules out for Other Partizan in August, so that might take some time as well. You're Invited to a Preservation Announcement at Antietam! Please join the Civil War Trust, the National Park Service, and the National Park Foundation for a special ceremony announcing battlefield preservation efforts at Antietam National Battlefield and throughout the nation. The event will be held on the historic Antietam battlefield just north of the National Park Service Visitor Center. Wednesday, July 5, 2017, 11:30 a.m. Please send RSVPs and questions to rsvp@civilwar.org. Follow Civil War Trust signs for parking. Refreshments will be available throughout the event. A public tour of the battlefield will follow the ceremony. Please forward this invite to your friends in the Maryland and Washington, D.C. area. Great looking old school 10mm Ogre sculpts, cast in the Lead free Pewter. 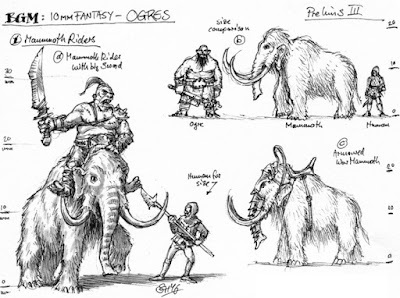 In this phase two release wave, meet the Ogre Mammoth Riders. Welcome back to Black Gate Miniatures' range of 10mm Fantasy Ogres for the upcoming Kings of the North Miniatures Game (KotN). 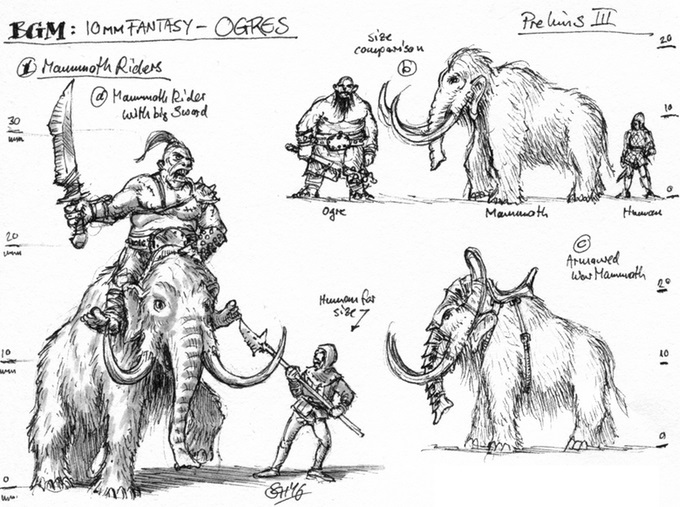 Phase two will bring to life the fearsome Ogre Mammoth Riders. 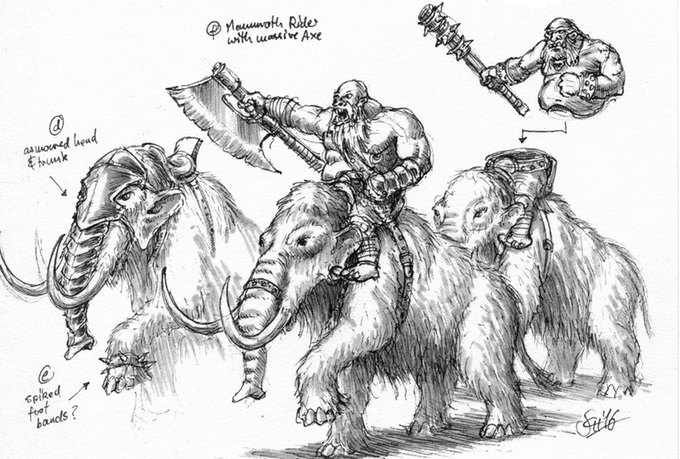 Consisting of 3 individually sculpted rider models plus 3 Mammoth mounts. They are cast from Lead-free Pewter and scaled at 10mm. I need £500 to cover the remaining sculpting and production costs in order to bring these bad boys to life. 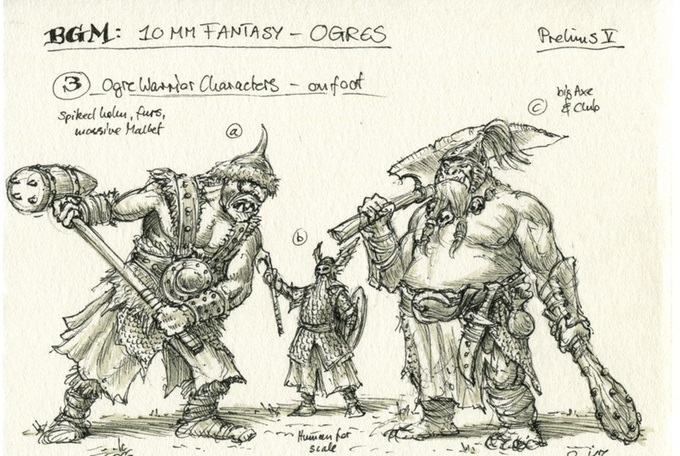 The price of £9 per unit featured in pledges of Ogre Warrior is exclusive to this Kickstarter. The regular price will be £10 per unit after the Kickstarter ends. 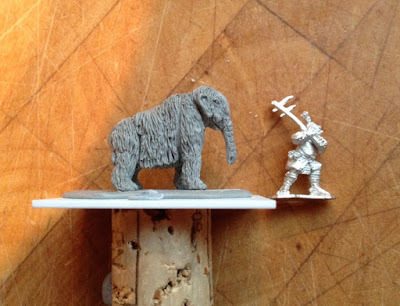 For the first time ever, we are also offering an Early Bird Special, 50 lucky backers will be able to purchase Mammoth Riders for the incredible price of £8 per unit. 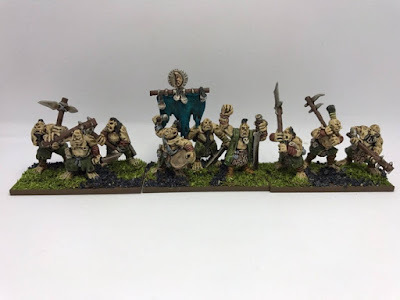 Greenling £1 - For those people who want to help the project succeed but don't want any Ogres themselves. You get a big thank you from me and a Karma boost. Stretch Goal 1: £1000 - Character pack add-on for £10 per pack. Unlocks the Character pack. 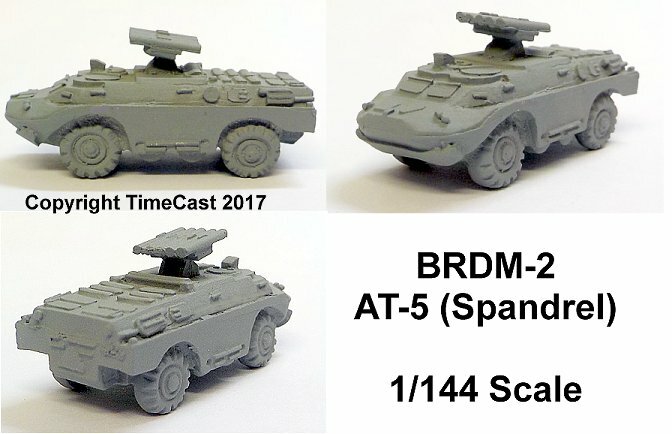 Featuring two Chieftain models and two Shaman models, all on foot. Available to all pledge levels for £10 per pack. 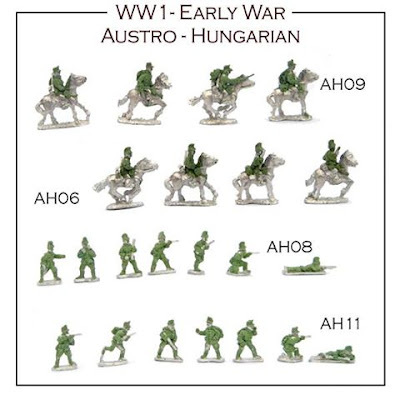 Each pack contains one of each of the four models. Stretch Goal 2: £1500 - Mammoth Rider Character Pack add-on for £6 per pack. 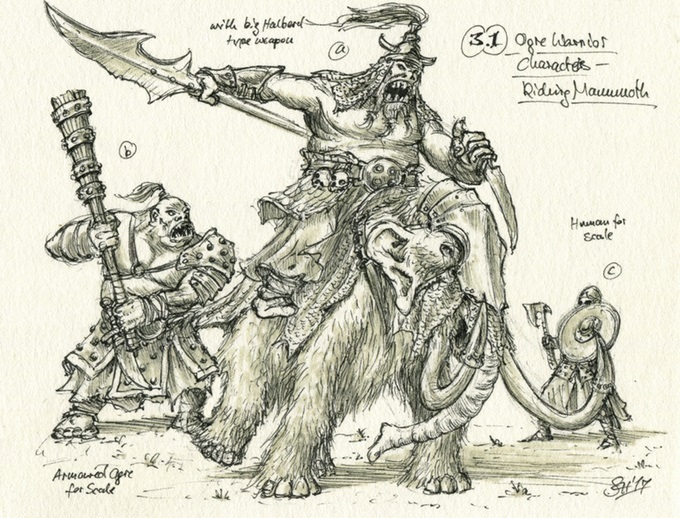 Unlocks the Mammoth Rider Character Pack add-on. 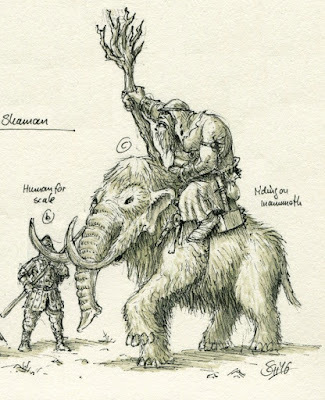 Choose from either a Chieftain or Shaman model riding a Mammoth. 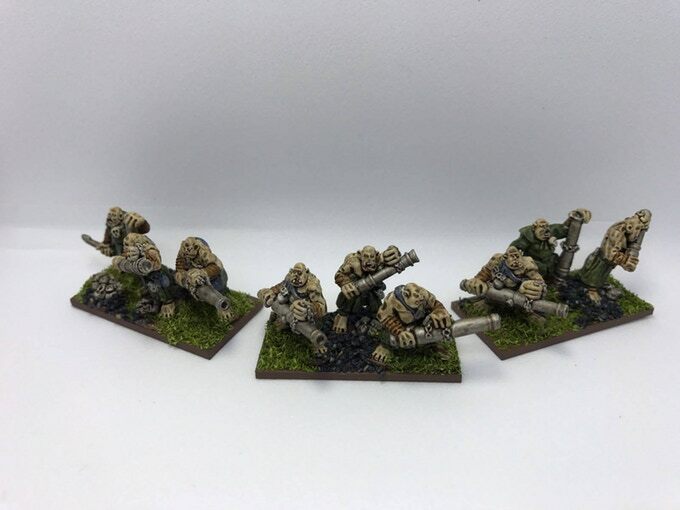 Available to all pledge levels for £6 per pack. 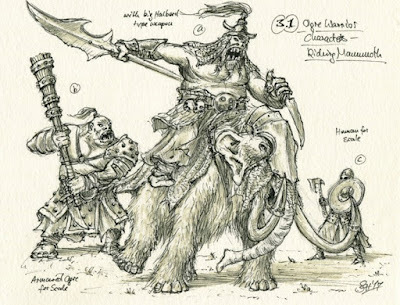 Stretch Goal 3: £2000 - Yeti unit add-on for £8 per pack. Unlocks the Yeti unit add-on. 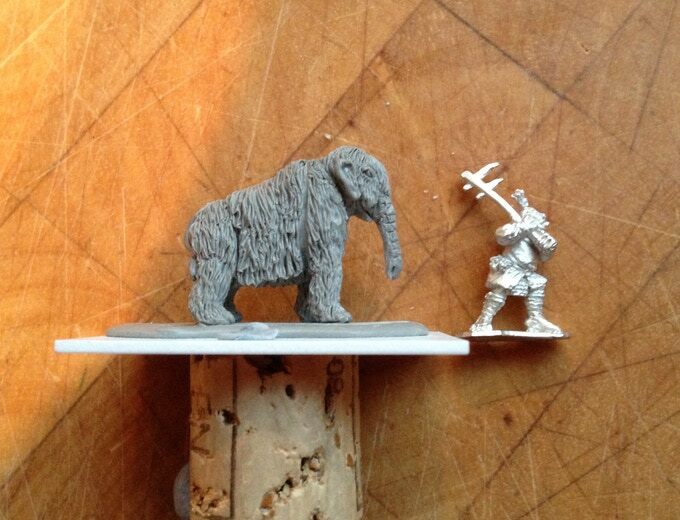 Featuring 3 individual sculpts and available for a Kickstarter exclusive price of £8 for a pack of 9 miniatures. Once the Kickstarter is finished they will revert to the normal price of £9 per pack. 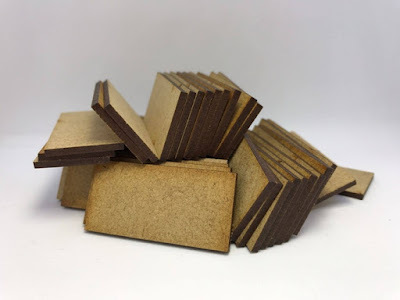 40x20mm Basing Packs - Laser cut from 2mm MDF, supplied in packs of fifty (50) bases for £3. * Based on past experience (of us and others), we will be charging shipping after the Kickstarter concludes based on the actual costs incurred to ship. We will collect this via Paypal after the campaign ends. This is so we can be fair to all our backers (shipping is rarely one size fits all). UK The costs between £1 and £4 for 2nd class delivery depending on weight. Europe The costs are likely to be around £6 for 500g (10 units), £10 for 1kg (20 units) and £14 for 2kg (40 units). World Zone 1 (North America, South America, Africa, the Middle East, the Far East and South East Asia) the costs are likely to be around £8 for 500g (10 units), £14 for 1kg (20 units) and £21 for 2kg (40 units). World Zone 2 (Everywhere else) the costs are likely to be around £9 for 500g (10 units), £15 for 1kg (20 units) and £23 for 2kg (40 units). 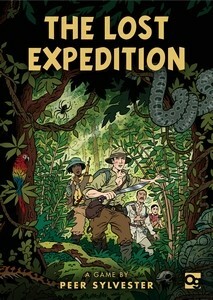 The only real risk apart from if the Kickstarter doesn't fund, is that it funds too well! This is our second Kickstarter and the first was delivered on schedule in April 2017. The production is all being done in-house and so if the order book gets too big then I may have to delay the shipping date a little from the October 2017 deadline or send orders out in batches. As we celebrate our 30th anniversary, I'd like to look back at some of the properties saved by the Civil War Trust at battlefields where the United States Colored Troops fought. Ultimately, more than 180,000 men of African descent enlisted in the 175 USCT regiments that served in the Union Army. These soldiers quickly earned a reputation for courage under fire. They fought valiantly at the Battle of the Crater near Petersburg and charged into seas of gray and butternut at New Market Heights and Fort Wagner. In honor of their legacy of service and sacrifice to the United States, the Civil War Trust works to preserve these sacred places, from the plains of Oklahoma to the shores of South Carolina. To date, the Trust has secured 256 acres of land at Port Hudson, 118 acres on Morris Island -- where the 54th Massachusetts famously assaulted Fort Wagner in July 1863 -- and more than 520 acres associated with the siege of Petersburg, including the infamous Battle of the Crater, in July of 1864. Other preservation successes include protected land at Cabin Creek, Honey Springs, and USCT-related sites in North Carolina, Arkansas, Mississippi and beyond, totaling more than 1,000 acres of hallowed ground! This is an incredible achievement and you should be proud to share in these successes. The stories of courage and bravery surrounding the American Civil War are not limited by color or creed, and the Trust remains committed to preserving an array of sites that reflect the full diversity of this era. It is truly remarkable what you have helped us to achieve, and I would like to personally thank each and every one of you. A preview of the master figures for the WW1 Early War Austro-Hungarian Dragoons and Hussars, both mounted and dismounted - to be released shortly. The July issue of Miniature Wargames is available. 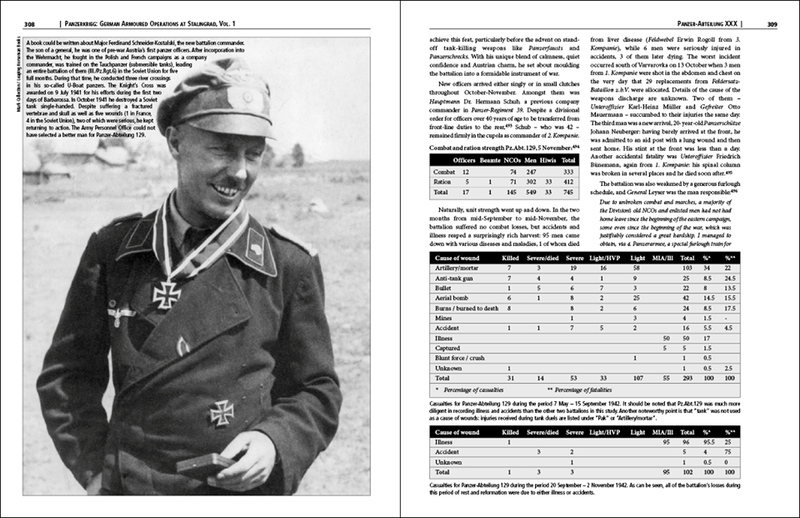 What’s up and coming in (mostly) historical wargaming. Perry’s plastics and Travel Battle, a new DeepCut mat, Mad Dogs with Guns, 3D printed models from Butler and explosion markers. 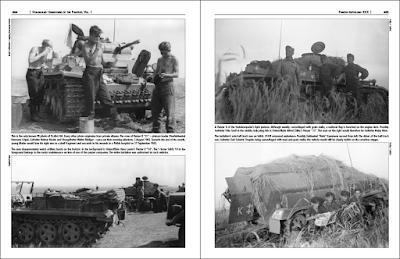 Advancing like men: a “Little Inkerman” Scenario for The Men who would be King by Conrad Kinch. Roger Dixon walks us through the recent popular show in Newark full of (mostly) historical eye-candy. 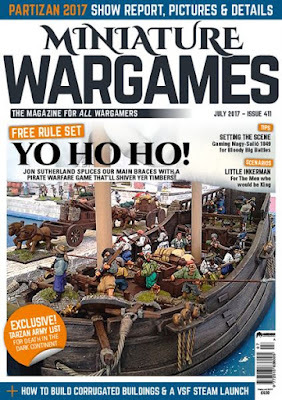 Jon Sutherland gives us a full rule system for piratical shenanigans on the high seas (with downloadable play aids). Consider your timbers shivered! 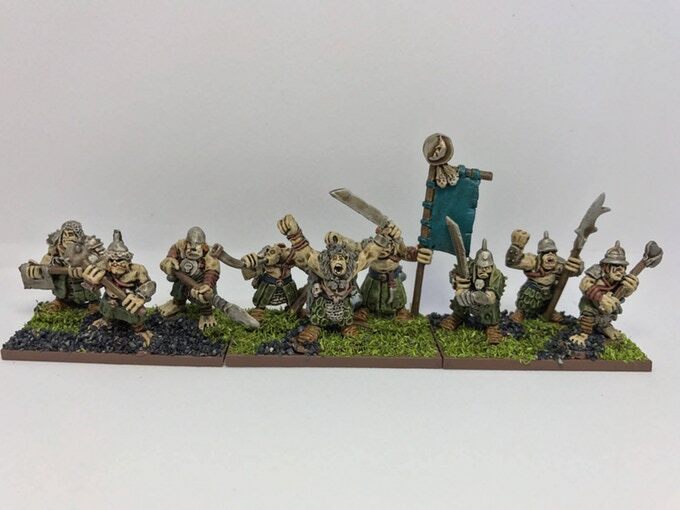 This month Fantasy Facts has its usual round up of what’s out in the world(s) of non-historical gaming: new releases from Ground Zero games in 15mm; Crooked Dice in 28mm; Brigade in 15mm and 10mm for scenery and some space ships. On top of that there’s a look at new games from Great Escape. There’s also the second and last part of Graham Green’s Painting the Army of Gondolin plus scratch building a VSF steam launch. Designing a scenario. Chris Pringle – author of the “Bloody Big BATTLES!” rules – walks us through the construction of his recreation of Nagy-Salló 1849. Corrugated. Diane Sutherland builds some fences and shacks from crinkly cardboard and plastic!